Can churches reverse declining membership? An increasing number of Americans describe themselves as spiritual but not religious, and while 89 percent profess belief in God, many Roman Catholic, mainline Protestant and evangelical churches are losing members. Among Catholics, polls show that disagreements over church teachings, along with the effects of clergy sexual misconduct, have led many to leave the church. Protestant churches, meanwhile, have struggled with their own scandals and problems, including the disillusionment of many young adults. Some experts speculate that American Christianity is shifting toward a European model, in which many profess to be Christian but attend church only occasionally. 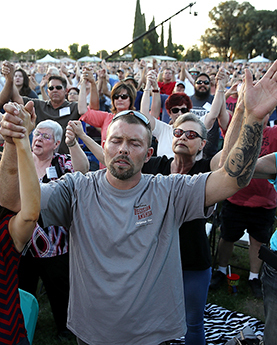 As religious trends shift, experts debate their long-term implications. Some note that despite declines in older denominations, many newer churches — including so-called megachurches that draw thousands of attendees — are thriving. To attract members, especially teens and young adults, some churches are making services more contemporary and emphasizing social and environmental messages.